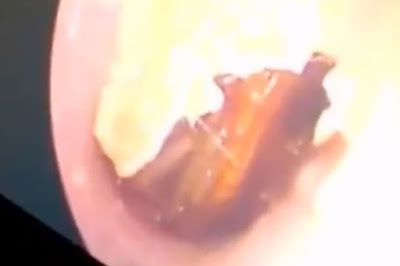 A gruesome video shows the moment a woman had a live cockroach removed from her ear after it crawled in there while she slept. The woman surnamed Su, of Huaihua City’s Hecheng District, in Central China’s Hunan Province, told doctors that she did not know precisely what type of bug was inside her ear, only that it was still alive and continued to crawl and scratch. She is said to have tried to remove the insect by herself , but whenever she reached into her right ear with a cotton bud, the creature only burrowed deeper and deeper. At the hospital in Huaihua City, it had to get worse before it could get better for the poor woman, as a doctor told her he had to spray it with chemicals in order to subdue it. The doctor warned that the procedure would "cause [the insect] to become agitated" and that she would "feel it moving a lot." 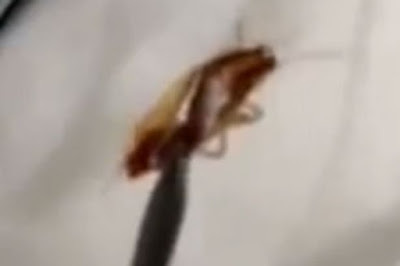 Footage of the procedure shows Su in extreme discomfort as a doctor looked into her ear for the insect, followed by the horrible moment the cockroach was slowly pulled from her ear canal - alive. Su is not expected to suffer any long-term effects from her insect guest. So, the space in the ear can contain such a big thing??? Only in China,nah dead sleep she dey sleep abi nah wetin only mosquitos noise self i don wake not to talk of say he come bite me,as biyas coackroach. No be lie if nah Naija now them go dey look for pastor wey go pray for the ear instead to carry her go meet doctor.